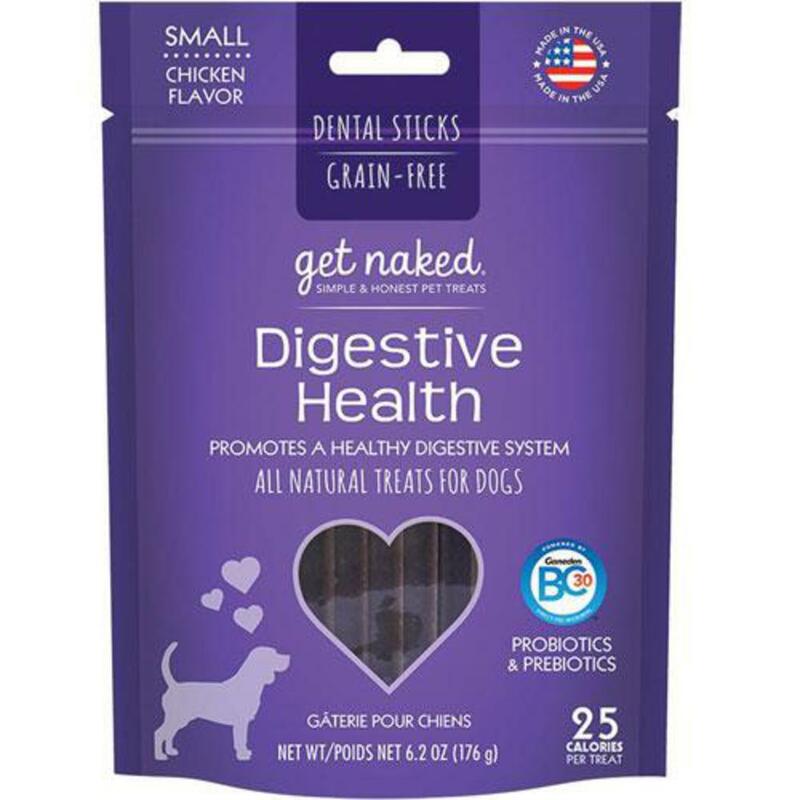 Help support your furry friend's digestive health with Get Naked Digestive Health Dental Chew Sticks Dog Treats! These tasty treats are specially formulated with a blend of dietary fiber, prebiotics and probiotics to help support your pup's gut health. 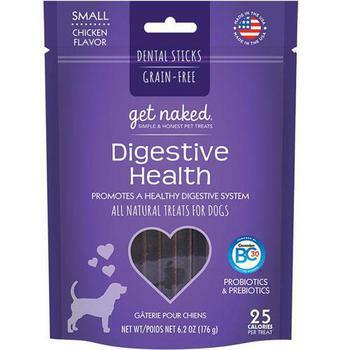 These digestive health sticks work to improve the total number of beneficial microflora in his digestive system so he can feel his best. These chicken-flavored treats are also grain-free and help to remove plaque and tartar build-up as your dog chews! Treat your pup to a nutritious snack with these delicious dental chew sticks! All-natural, savory chicken flavored dental sticks help to support dental health as your canine companion chews. Prebiotics and probiotics help improve the total number of beneficial microflora in the digestive system to support your pal's digestive health. Gluten-free doggy treats made without corn, wheat or soy so your pup can feel his best. High in dietary fiber with oat fiber, flaxseed, and chia seeds and only 18 calories per stick for a low-fat and low-calorie treat. Help keep teeth white by reducing buildup of plaque and tartar.